Bordeaux is a wine, a wine district and a city. A city that is strategically placed for visits to the well-known wine districts like the Medoc, Graves and Saint Emilion. It is a city well worth visiting before going off to the vineyards. It is one of the biggest cities in France and probably the most elegant of them all. Bordeaux lies on the river Garonne, close to the Atlantic Ocean. Water is very important in Bordeaux. It is important for the vines because it has a mellowing effect on the climate, preventing the winter from being too cold and the summers from being too hot. 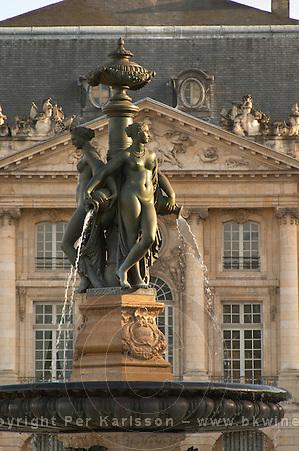 From being a town with narrow, winding streets – the way towns were at that time – Bordeaux became, in the 18th century, perhaps the most beautiful city in the whole of France; wide avenues, stately homes, built of light-coloured sandstone and small private palaces along the quayside and along the magnificent horseshoe-shaped Place de la Bourse. The splendid Opera, Le Grand Theatre, was also built in the 18th century by the architect Victor Louis. Some years later one of his apprentices built one of Medoc’s most famous wine chateaux, Château Margaux – and you recognize the style. Bordeaux’s facade cleaners have enjoyed a veritable boom in recent years and the whole city seems clean and bright. Not only the houses but also St Andre’s Cathedral has been restored to its original bright colour. Bordeaux is a big city with about 700 000 inhabitants. The centre is small, almost everything can be reached on foot; when not, one simply hops on one of the trams. They are ultra-modern, futuristic even and they glide soundlessly through streets to the annoyance of the motorists because many of the central thoroughfares have become off-limits to cars. One enjoys the experience so much more as a pedestrian, strolling pleasantly along the elegant Cours de l’Intendance, with all the exclusive shops and famous brands. You can, for example, take a look in the wine shop L’Intendant with its huge selection of prestigious chateaux of all vintages you can imagine. In Bordeaux it is not always possible to buy wine directly from the chateaux, so the city’s many wine boutiques really come in handy. 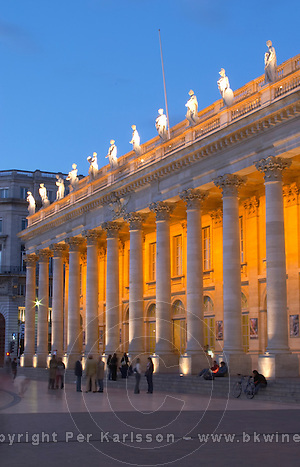 Down by Le Grand Theatre, we are in the very heart of Bordeaux. You can take a pause and watch the street life in one of the many cafes. 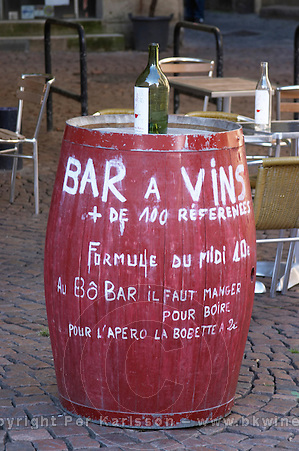 Order a coffee, or perhaps a small Lillet, the Bordeaux district’s own aperitif. Close by is the Maison du Vin de Bordeaux which has opened a very good wine bar a few years ago selling wine by the glass at very reasonable prices. And, across the street, you have the tourist office. Here one can get hold of maps, information about the wine chateaux and anything else that might be of interest to visits around the wine district. At the Rue St-Catherine, we turn towards Vieux Bordeaux, the old town. 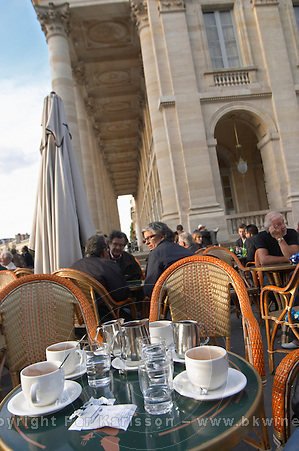 We find our way to the beautiful Place du Parlement with its many cafes and restaurants. Chez Philippe is a seafood restaurant where you can get marvellous local oysters and fish. On the corner is a Danish (!) owned wine store, Cousin et Compagnie, offering a variety of wines from Bordeaux and the rest of the world. They have strange opening hours, but rather handy for the tourist, between 10 AM and 10 PM every day of the week. Most other shops close at 7 PM. Not far from there, the more “budget” level restaurants share the space around the old Eglise Saint Pierre church. Some of them are really good. 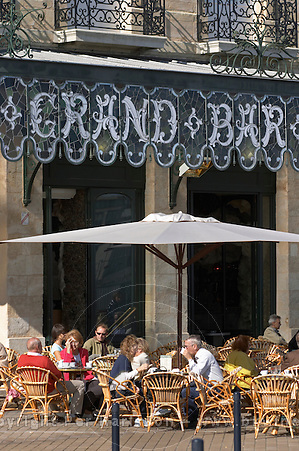 For instance Le Jardin des Gastronomes, where you can get a 3-course menu for less than 20 euro. The Quai des Chartrons, no longer warehouses! We continue down to the river and the legendary Quai des Chartrons. In the old days, this is where les negociants (wine wholesalers) had their offices and warehouses. At the time the majority of wine sales passed through these negociants, who even bottled the wines of the famous chateaux. Nowadays most of the chateaux bottle their wine themselves. However, these wholesalers still perform an important function as a sales channel and many of them also have their own labels. Most of them though have moved to the outskirts of town. It was not very practical to have large warehouse facilities in the middle of town. So now they have renovated the old houses and pavements and many restaurants and cafes have moved in. There are a few old signs left that tell the story. Schroeder & Schyler, for instance, are still here. If you are in the mood for some culture the Museum of Modern Art is close by, housed in a gigantic old warehouse built in 1824. The whole place has been beautifully restored. In fact, the warehouse itself is just as remarkable and worth seeing as some of its temporary exhibitions. One of the things I love about France is the food markets. On Sunday mornings you find an excellent one at the Quai des Chartrons. It is a very lively market and you get the impression that everyone in Bordeaux is there! If you are a little bit hungry you can take a few oysters and a glass of wine. 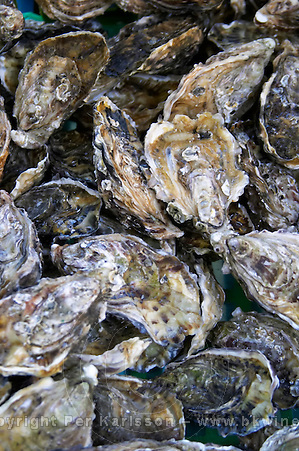 Oysters are perhaps the most well-known gastronomic speciality of Bordeaux as we are not far from Arcachon, the classy seaside resort as well as an oyster lagoon, where we find some of the biggest oyster farms in Europe. A typical Bordeaux speciality is to serve the oysters together with sausages, so-called crepinettes. Very good but rather strange, to my taste. The drink to go with oysters is, of course, a white crispy Entre-deux-Mers. There is another food market on the other side of the river, if you cross the Pont de Pierre. Bordeaux lies in the southwestern corner of France and a big speciality in the south-west is duck and you eat just about everything on the duck! A marvellous combination, which is often served in restaurants, is fresh duck liver (foie gras), rapidly fried and served with a glass of Sauternes: foie gras poëlé. Duck breast (magret de canard) is another typical dish you get in a Bordeaux restaurant and also entrecôte, with sauce Bordelaise, of course, made from red wine and shallots. And then there are all the restaurants! The Bistro Noailles in the Allee de Tourny is a typical French brasserie. The place is lively, often very crowded but they always seem to find a table for you. People come here for their entrecote steak and oysters. And all the other delicious things. Another favourite dish is agneau de pauillac. It is a baby lamb with an extremely delicate taste. These special lambs are served for instance at the Cafe Gourmand near the Galleries des Grands Hommes, a small shopping mall. Not far from there is another good restaurant, Le Mably, hidden in a tiny back-street. It looks very traditional and indeed it is. The food is traditional, but with a certain innovative finesse and very well prepared. At the Baillardran in the Galerie des Grands Hommes (as well as in quite a few other shops in Bordeaux) you can buy the caneles de Bordeaux. This is another of the gastronomic specialities of Bordeaux: a little cake made from egg yolk, vanilla and rum as its most important ingredients. Enjoy them together with a sweet Bordeaux wine. Or with a coffee. Truly delicious and something you must try at least once when in Bordeaux! As night falls we stroll over the beautiful bridge Pont de Pierre (which was commissioned by Napoleon) to the other side of the river to admire the spectacular houses along the quay. The facades of the houses are so beautiful that when the tramway was built they designed a special ground-based power feed technology so that no suspended electric cables would disturb the harmonious appearance of the facades. In a few places, you can still see a building that has not been cleaned. The difference is amazing. The Old Town of the city of Bordeaux is today on UNESCO’s World Heritage list and one can see why! It is a beautiful and elegant city, full of history, and local gastronomy. And it is the perfect place to be to explore the great wines of Bordeaux region! And finally, you must not miss one of the most amazing spectacles in the newly renovated old Bordeaux: Le Miror d’Eau, literally, the water mirror. It is a “fountain” that changes from being filled with water, enveloped in a mist, and empty. At its most magnificent at nightfall. It sounds strange and it is. You should go see it just as night falls and all of the illuminated Place de la Bourse’s magnificent facades are reflected in the surface – it is called miroir for a reason. Le Mably, 12 rue Mably. Tradition and well prepared French cuisine. La Belle Epoque, 2 Allées Orleans: Attractive turn of the century belle-epoque atmosphere. Cafe Gourmand, 3 Rue Buffon: Quite innovative, combined with the more traditional. Maison du Vin, 3 cours du 30 Juillet : wine bar with small dishes. There are plenty. Here are two. Cousin et Compagnie, Place du Parlement, open from 10.00 to 22.00 every day. L’Intendant, 2 Allees du Tourny.